Like 13,000 plus other birders around the world, I watched birds on May 9th and submitted the results to eBird. Although I could have spent a morning birding at one of my favorite sites in Costa Rica, I couldn’t just settle for that. No, instead, I had to do a Big Day because it was too good of an excuse not to! Well, that, and the fact that my previous Big Day attempt in 2015 got rained out. Oh sure, myself and my stalwart birding companions and friends Susan and Robert could have kept going until well after dark but when most of the morning got rained out, it just didn’t seem worth it. You see, in the tropics, if you really want to record a lot of birds, you need that all important dawn chorus and a morning that does not include constant rain. A rain-free dawn and morning gives you a chance at hearing a high percentage of forest species when they vocalize (and some of them might call for just a minute or so) that you probably won’t see at other times of the day, and presents the main opportunity for finding a hundred or so other species of birds. 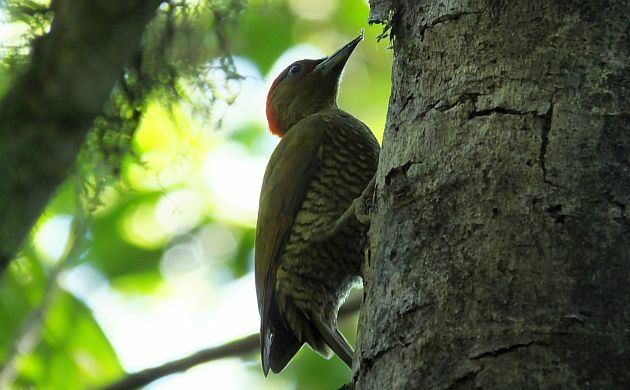 Rufous-winged Woodpecker– one of the many forest-based birds in Costa Rica. Yes, that’s right, a hundred or more species plus the ones heard at dawn. If enough rare birds are heard, you just might break a record, and since I know that getting the world record (even the new 35o plus one) is possible in Costa Rica, I can’t help but try and go for the avian twitching gold. I knew that our chances for “gold” were diminished by the recent departure of wintering birds, and that morning rain could always stop us in our tracks, but what was the chance of that happening when the forecast called for partly cloudy weather? Pocosol Research Station: A visit to this site is always a highlight. Never heard of Pocosol? Well, although logistics keeps it off the itineraries of birding tours, if you can get there, do indeed pay a visit because it has some of the best primary forests I have seen in Costa Rica and is one of the birdiest places I have seen in the country. This is why I chose it as a place to kick off the dawn. Being back in the rainforests of the Penas Blancas valley would give chances at loads of uncommon yet expected forest species like antbirds, woodcreepers, motmots, and so on while also giving us an outside chance at rarities like Black-crowned Antpitta, Great Jacamar, and who knows what else. “I hope the rain stops by dawn”: I probably said this after trying once more for owls and being treated to the same wet sound of dripping water, windy leaves, and vocalizing frogs. It was indeed a fantastic night for frogs (one stream was punctuated with the chirping calls of glass frogs) but since we weren’t bothering with a big day for amphibians, we would have traded all of them for a single Crested Owl. “Rufous Motmot!”: Expected but since this was our first species, it is both a highlight and a quote. I was so thankful for that motmot. Unlike all those sleeping woodcreepers, antpittas, and other lazy birds, it wasn’t going to let a bit of rain stop it from hooting at five am! A few other birds also called but since we are talking about ten or so species instead of forty or more, this was not a good sign. Leaving Pocosol: Hard to believe that was a highlight but a combination of mist and soaking, pouring rain while you need to hear and see birds can change your mind about even the best spots for birding. “Black Phoebe! Wait, no, another Dusky-capped!”: It was so wet that the normally obvious Black Phoebes were hiding in their holes, under bridges, or wherever they go during a deluge. Every time I thought our Black Phoebe was in view, it turned out to be soaking wet Dusky-capped Flycatcher. I wish I had a photo but I didn’t want to drown my camera. We ended up dipping on that “given” bird. 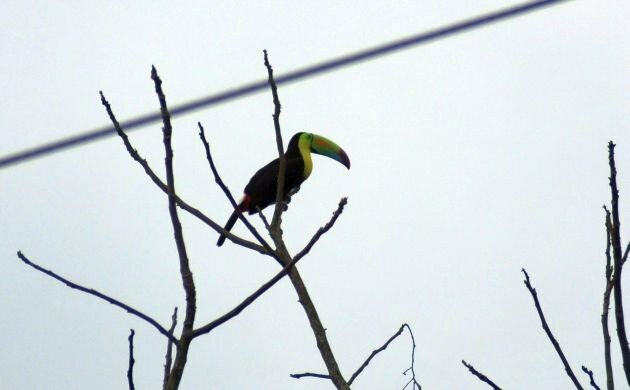 Reaching Lands in Love: Due to the constant rain and the growing feeling that I may have been nearing a birding Big Day meltdown, we left Pocosol ahead of schedule to see if it was drier at Lands in Love and the Manuel Brenes road. Happy day, it was! Although the early morning birding was back there under water at Pocosol, the rain had indeed stopped at Lands in Love and some birds came out. Yes, Gray-headed Chachalaca, flycatchers, Red-throated Ant-Tanagers, Rufous-tailed Jacamar, and others including my year Alder Flycatcher. We still missed a bunch but we were just pleased to see and hear birds without having to hold an umbrella. 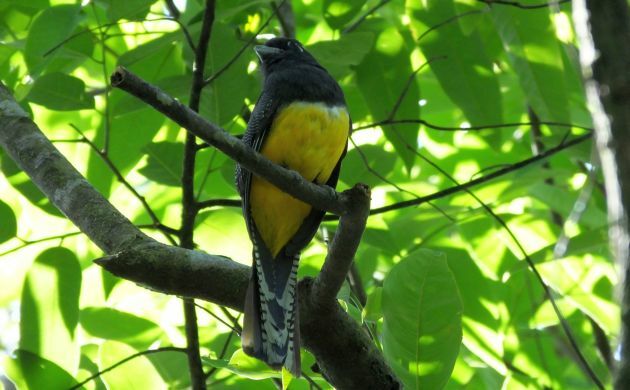 Lands in a good area for Gartered Trogon and many other lowland rainforest species. “Snowcap!”: Another highlight/quote. We got this one on the road to Manuel Brenes, another fantastic, little know site in the Tilaran Mountains. An hour and a half on this road in the middle of the day worked out with excellent mixed flocks, several hummingbirds, and some uncommon forest birds. I had considered starting there are dawn and in retrospect, yes, we should have. Cocora Butterfly Garden: Highlight of highlights. What I liked about this place was how smooth everything went. I would say to Susan, “We hope to get White-throated Spadebill.” and then one would call in response. Seriously. Talk about my kind of friendly birds! In a matter of minutes, we picked up a dozen or more cloud forest targets, one after another, in the not usually birdy time of early afternoon. A nice, family-owned place, I will always recommend it. Crimson-fronted Parakeet in San Ramon: This isn’t a rare species in Costa Rica but we only had one chance for it and that was while we were driving through the small city of San Ramon. One pair appeared in flight for one second and we both got it. Talk about relief! “Respond dammit! Respond!“: No, fortunately, not a visit to the emergency room. Just hoping that a Rufous and white Wren, Long-tailed Manakin, or some other bird would respond to playback while we waited in road work. The habitat looked good, and I was holding the playback device through the sun roof but I guess if there was road work near my home, I wouldn’t respond either. Things can get tense during a big day, thank goodness for chocolate. “Is it hotter than normal?“: This was an actual quote and yes, I think it was hotter than normal in the already blazing Pacific lowlands. Not many birds flying around but I couldn’t blame them. I mean if I were flying around, I would be worried about pulling an Icarus too. Thick-knees and other dry forest species: It was four in the afternoon and we had very little time to check the dry habitats on the road to Chomes, our last stop for the day. Thankfully, a bunch of dry habitat birds made themselves known including several Double-striped Thick-knees, Turquoise-browed Motmot, Orange-fronted Parakeet, and other nice birdies. Thanks birdies, especially that uncommon Harris’s Hawk that decided to perch in view way far out in a field! 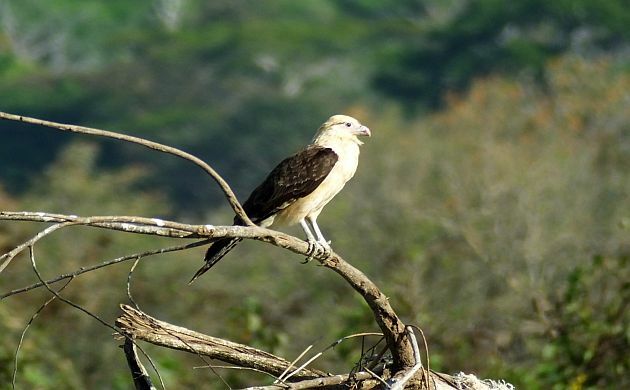 We also got our only Yellow-headed Caracara. “Oh yes, there are shorebirds!”: Shorebirds play a crucial role on Big Days in Costa Rica. At least they do on my Big Day routes and this is why they have also been a bane on previous Big Days. Plovers, sandpipers, terns, herons, and other waterbirds can add 40 or so species to the list, and if they are around, can be concentrated in one spot. Get to that spot and the day list can get a huge boost with little effort. On the other side of the coin, if you drive all the way to Chomes (the best shorebird site in Costa Rica) and the birds aren’t around, you lose the gamble and run out of time. On May 9th, there were indeed shorebirds at Chomes but diversity of sandpipers and plovers was low. So, it wasn’t the huge influx we had hoped for but it was still good enough because we got come uncommon migrants like Great Blue Heron (this is Costa Rica we are talking about), Caspian Tern, Black Tern, Black Skimmer, and American Oystercatcher in addition to expected, common species. It was also cool to see 300 Black-bellied Plovers in breeding plumage. “Quail!“: I meant “Spot-bellied Bobwhite but “quail” is what came out of my mouth when a covey ran off the road and buzzed over a sugar cane field. Good one to get for the count! 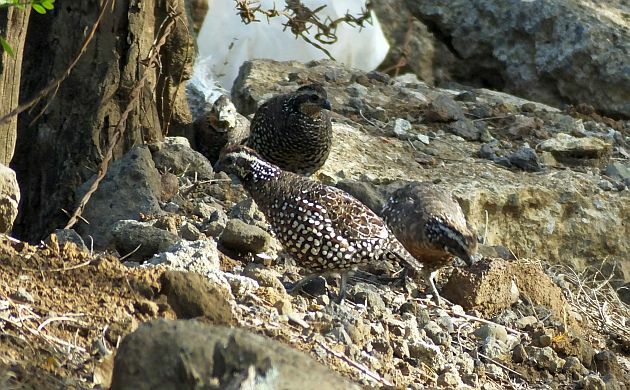 Spot-bellied Bobwhites (recently lumped by the AOU with Crested Bobwhite) blend in with their surroundings. Hundreds of White-fronted Parrots: This is a common species but you really don’t know how many might be around until you see them stream in to roost at mangroves in Chomes. There were a least 300 screaming and flying around and there were probably more. The sun was going down, Lesser Nighthawks were taking to the air, mosquitos were creeping out of the surrounding wetlands…it was a memorable end to a long day of birding. 230 species: This was our final talley and given that we were rained out during the most important time and place of the day, we were pretty happy with that result. Other birders in Costa Rica did their own Big Days, including one team of guides who tied the existing record for the country with a total of 308 species! I hope they eventually write a summary of their incredible day. I loved this post! Great photos, I can’t wait to bird in Costa Rica someday. 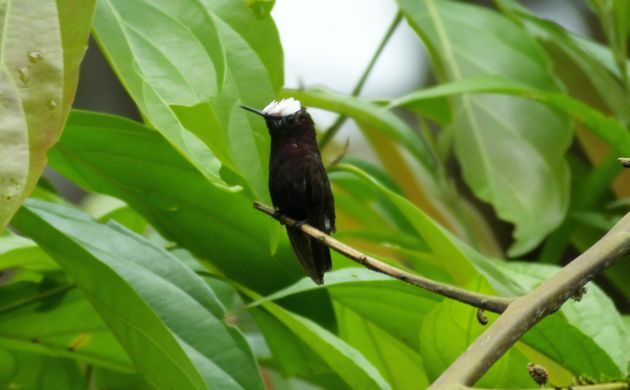 @Erica- thanks for loving the post, I hope you and all birders can visit Costa Rica some time. @Josh- I recall your tales of quail-doves on the trails and was hoping for some of that cool dove action. Maybe if we would have stayed longer but we had a Big Day schedule to keep. Hi Pat, just catching up on some past reading. Really enjoyed reading about your day–a less-than-successful attempt at a Big Day record is way more fun than just about anything I can think of–especially if it’s happening in Costa Rica. Do you happen to know if there was ever a write-up on that 308-bird Global Big Day in CR? I’d love seeing it if you can point me to it.